Welcome to part two of my conversation with @CandidCarrie. If you didn’t see part one, Let’s Talk About Cows, please go check it out. First things first! Happy Valentine’s Day! Dahlia here would like you to come just a little closer so she can lick ya! @CandidCarrie- Do they add water to skim milk to make it less milky? Couldn’t we all buy whole milk and water it down ourselves? Yes, these are the things I wonder. @DairyCarrie- Skim milk is milk that has had the fat “skimmed” off of it. The fat then goes to cream, butter or cheese. 2% and 1% have either 2% or 1% fat content. Whole milk is just that. You get all of the milk fat. Interesting thing… first all milk in the store is Pasteurized but milk is also Homogenized. Which means blended up so it doesn’t separate. Milk straight out of the tank on the farm will separate so that the cream or fat rises to the top. @CandidCarrie- Are these good questions or should I have already know the answers to these things by now? 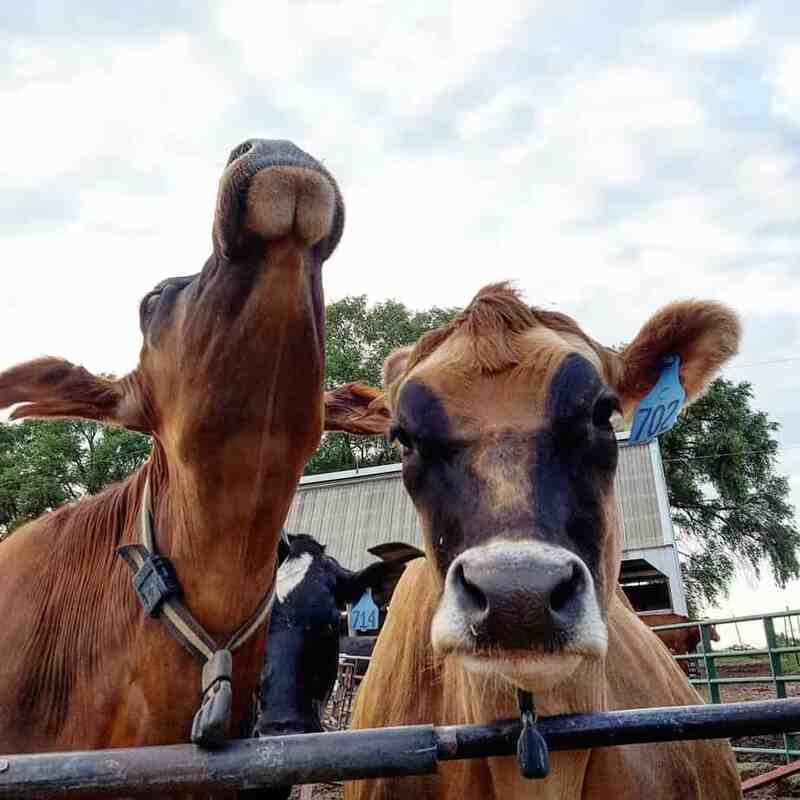 @DairyCarrie– I am surprised by the questions people have but not because I think you should know them but because it’s such a part of my life that it’s hard for me to realize how odd my life is compared to others. You have good questions. This clock may only be right twice a day, but I love it anyways. @CandidCarrie- OK, here’s a good one. Do you have a favorite, or several favorite vintage farmy things? Like a milk bucket with a story or a stool that makes you laugh because of the story behind it? @DairyCarrie– Well I wasn’t raised on a farm. I grew up in Madison so I don’t have a ton of favorite farm stories from growing up… But I do have a clock from the 28th National Square Dance Convention that my Grandma gave me… It doesn’t get much more country than that! Hubs hates the clock, which makes me love it even more. He also hates my bedside lamp, it’s a miniature leg lamp. He has no taste, obviously. We have an old barn that we will have to take down at some point. We are going to use a bunch of the boards in our house. @CandidCarrie– Oh, that is super cool! Love the clock! @DairyCarrie- Hubs and I also share a favorite tractor. It’s the first one that I really spent much time on and hubs grew up driving it. The old 930 had to make it into the wedding photos. @CandidCarrie- How often do you wash a cow. Is it shampoo or a power wash? @DairyCarrie– I don’t have a washing machine big enough to wash a cow so generally we leave it to them to take care of their own bathing. Kinda like cats, you can give them a bath, but all you get out of it is a pissed off cat and a blood trail. Show cows get baths before they go into the ring but the rank and file cows do not. @CandidCarrie- How many people die in cow related injuries a year? @DairyCarrie- I have no idea. You know that cows can’t really like bite you or anything. They only have teeth on the bottom. Some may try to lick you to death. You know the whole concealed carry thing that’s allowed in Wisconsin now? My father-in-law figures that farmers can’t carry a side arm because they would end up with no cows. His brother thinks that they would still have a few really well behaved cows…. Of course that is a joke, we wouldn’t really do that but an animal that outweighs you by so much and often has it’s own agenda can certainly test your patience some days. The girls, out for a stroll. @CandidCarrie- My husband grew up on a dairy farm. He hated it. They sold it when he was twelve. His stories are crazy. Like the time they were beheading chickens and the chicken with his head cut off chased him over the woodpile, behind the barn. All without a head. @DairyCarrie– Zombie chicken will haunt your dreams!!!! I have to be honest. We raised meat chickens for the first time this year. They are 100% devoid of personality. All they do is eat and grow. But when It came time to whack off their heads, I found a reason to run to town for something or other. I had no problem plucking after that point but I couldn’t handle the beheading. They were really tasty but it costs more money to raise your own chickens than it does to just buy chicken at the store. I do have egg producing chickens that I like very much and several of them have personalities. I could never eat them. Considering some of them are like 8 years old and they don’t lay eggs anymore, hubs considers them my pets. @CandidCarrie- and they did surfing in cow poop by holding their tails. @DairyCarrie- The surfing thing only works with cows that aren’t assholes. If you did that to a jerky cow you would get kicked. A cow kick hurts. It hurts a lot! Hope you enjoyed this post! Stayed tuned for more #DairyCandidCarrie posts in the future! If you have a question about farm, food, cows or whatever, just put it in the comments and I will try my best to answer! « I’m here to dispel one of the rumors going around about farmers. Nice Job Ladies 🙂 Another very informative post. Carrie you ought to see all of the cow stuff I have around here!!! lol Ok soo maybe the cows tend to follow us home in our “stuff” but at least they don’t make a mess!! Will definately agree that a cow kick hurts.. it hurts alot, always figure it is a good day when I make in through milking and haven’t gotten kicked, stepped on or squished!! Loved the picture of the cow at the top of the page! And Dahlia loves you too! She loves everybody! Cute interview!! I’ll have to interview some of our “cows” altho technically, they’re steers. For the most part. Love your blog! Off to read your “Rawhide to Velvet” piece!!! You can click around are read all kinds of things by clicking on the categories. Have fun and I hope you like! Sam is a Belgian horse weighing approximately 1900 pounds and standing about 17.3 hands tall. He is gelded and approximately 27 years old. Now, life with Sam can be interesting. If he ever discovered just how big he was, there would be no stopping him. Sam is a big boy. We shipped a red and white Holstein once that weighed 10lbs under a ton. Thankfully she was a sweetheart.